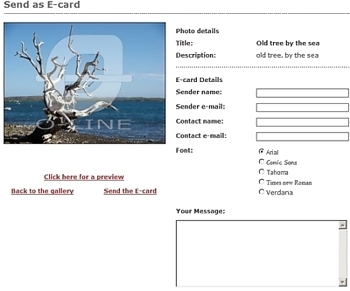 Any photo in the database of www.O-Line-Photos.nl can be sent as an e-card to whomever you want. Find and click on the icon under the photo to access the e-card creation interface. Your e-card will be sent compleatly FREE! Send as many e-cards as you want! Start browsing and send your E-CARDS today! come by, natural "real life photos"! For as low as 1 credit per photo!